The short narrows of Cottonwood Wash are easily explored and have become quite popular, since the entrance is right beside the access road, although this is not obvious and the canyon is easily missed. 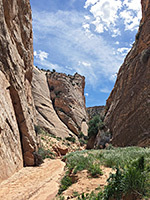 The approach is along the unpaved Cottonwood Canyon Road which follows close beside the wash for 25 miles, mostly in an open valley but the upper section of the creek flows through quite a narrow canyon, separated from the road by a thin strip of land formed by a steeply-angled layer of Navajo sandstone. This is one of the components of the Coxcomb, an elongated series of ridges running along one side of Cottonwood Canyon created by erosion of upwardly-pointing folded strata. The entrance to the narrows is at the west side of the Cottonwood Canyon Road, 22 miles from Cannonville and 25 miles from US 89, about 4 miles south of the turning to Grosvenor Arch. It is not signposted but is recognizable from a particularly colorful line of jagged red, orange and white rocks on the east side of the track (see 360 degree panorama), as it drops into a small valley formed by a minor drainage that flows from the east, under the road and through a narrow gap into the main canyon. There are plenty of parking places, on both sides of the road. 13 views of the Cottonwood Wash Narrows. TopoQuest topographic map of Cottonwood Wash. 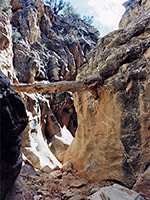 The narrows may be entered either along the bed of the side drainage or through an opening in the cliffs 100 feet south. 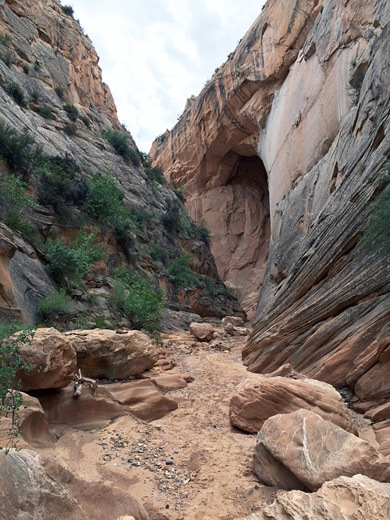 The canyon is interesting for a few hundred yards upstream and for one mile downstream, although the upper part is best - a few places are as narrow as any other of the Paria tributary canyons, with some minor dryfalls and pools and plenty of nice rock formations. Beyond the end of this section, the wash continues northwards for many more miles through a shallow, boulder-strewn valley. Turning south at the entrance, the wash becomes quite deep and generally rather wide - for long distances sandbanks with trees and bushes line the streamway on both sides but there are also a few dark narrow passages, enclosed by high, vertical cliffs of Navajo sandstone streaked with desert varnish. After 20 minutes walk the canyon bends 90 degrees to the east and cuts through the ridge separating it from the road, and thereafter flows south through a much wider valley. The hike is completed by walking up the road back to the parking area, and the round trip to both parts of the narrows takes just one hour.